The proposed volume of the culture pavilion for the city of Basel preserves and respects the eight horse chestnuts and the large plane tree situated in the plot assigned in the central Barf├╝sserplatz . 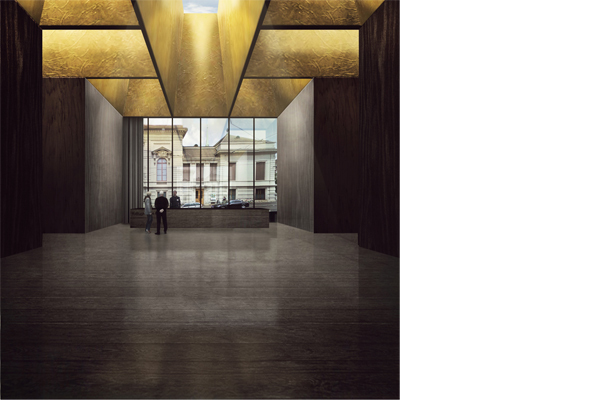 The pavilion, with the exception of the pillars, is made wholly out of wood, treated with the use of black dye, while inside the surface of the beams is coated by a thin layer of gold foil. The light, as a material of the space, filtering through the skylights, skims the golden surface of the beams and diffuses glows in all directions, giving back to the place an almost liturgical character, producing an effect of aerial suspension, in which the weight of the material seems to dissolve itself as for the absence of gravity. emanuela ortolani (marino – rm, 1984), michela romano (roma, 1983), david vecchi (palestrina – rm, 1985).